Everyone has a superpower. What is yours? In El Deafo, author-illustrator Cece Bell shares her experience growing up deaf. I was a regular little kid. I played with my mom’s stuff. I watched TV with my big brother, Ashley, and big sister, Sarah. Everything was fine until, at 4 ½, she contracted meningitis. We are not told how long Bell was in the hospital recovering, but when she got better something was different. Bell does a terrific job conveying her frustration at being different, especially when wearing the clunky hearing devices, so different from what children use today. Though she could hear people talking, Bell couldn’t always make out what they were actually saying. Things changed when she gets The Phonic Ear. Paired with a microphone, the Phonic Ear allowed Bell to hear her teacher, Mrs. Lufton. The Phonic Ear, clarifies her voice-really sharpens it! Even when I don’t see Mrs. Lufton’s face, I can understand every word she says without having to lip-read at all. In fact, the Phonic Ear was so powerful Mrs. Lufton could be heard wherever she was in the school building...even the bathroom! FLUSH!!!! There are some very funny moments in El Deafo, and heartbreaking, too. Readers will relate to the universal feeling of wanting to fit in and have a best friend. As Bell states in the author’s note, I was a deaf kid surrounded by kids who could hear. I felt different, and in my mind, being different was not a good thing. It is unfortunate that it is only when we are adults can one truly appreciate our uniqueness. Only then can we accept that, being different can be turned into something amazing. Our differences are our superpowers. This memoir, told in graphic format, is both amusing and very moving. It will appeal to fans of Smile by Raina Telgemeier. El Deafo is a must-read for every one. 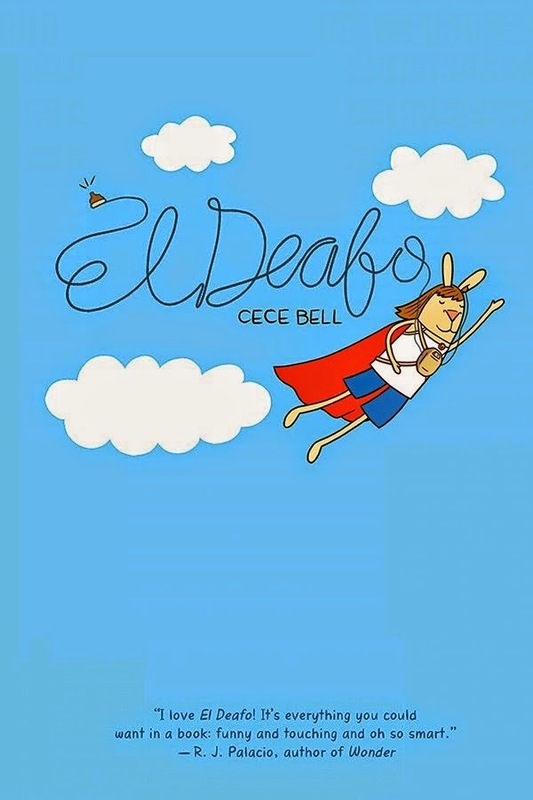 Watch the video of Cece Bell talking about El Deafo.